Uber has announced the launch of its minibus service ‘Uber Bus’ in Cairo, making Egyptian capital first city in the world to have the service. 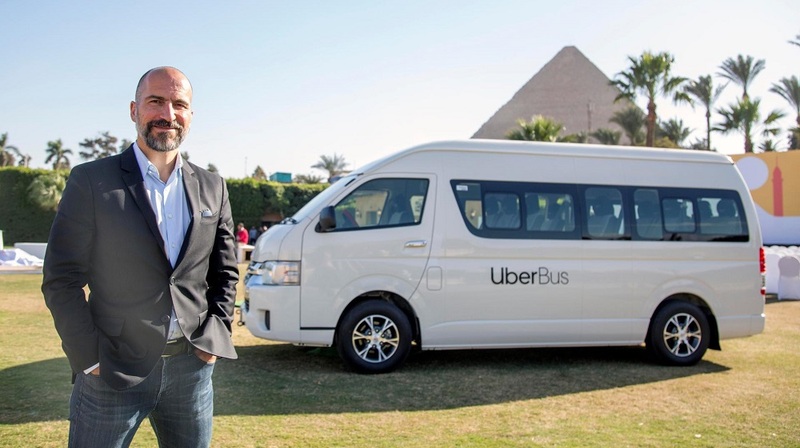 The announcement was made by Uber CEO Dara Khosrowshahi at a press conference with Giza pyramids in the background. He was also joined by Egypt’s Investment Minister Dr. Sahar Nasr at the event. The news comes a day after Careem launched Careem Bus in Cairo. “Egypt and the Middle East region are hugely important to Uber and we will continue to heavily invest in this part of the world,” he added. He also pointed out the Egypt is among the top ten global markets of Uber in terms of number of trips. Egypt is among Uber’s top 10 global markets in terms of the number of trips, and the company aims to further scale up its business in the fast-growing market, where it employs over 90,000 drivers. “When you request your ride through the app, we will find other passengers traveling in the same direction so that you can get to your destination with fewer stops. And, because you are sharing your ride with other Uber passengers, the price is affordable enough for everyday use, while still maintaining Uber standards,” the company added. The service is part of Uber’s main app. Careem has gone a different route launching a dedicated mobile app for it. In-case of Uber, when a rider selects a pick-up point and destination that is within the neighborhoods covered by Uber Bus, they’ll see it as an option in the app. Explaining the pricing in the blog post, the company had said that the riders will see the exact price before they make a booking. A trip from Shehab Street to Tahrir Square, for example, has a fixed price of EGP 10, according to the blog. As the graphic show, the service currently runs between two lines: Nasr City – Mohandessin, Heliopolis – Mohandessin. Uber’s General Manager for Middle East & North Africa Abdel-Latif Waked, speaking to Egyptian publication Arham said that the service will be 80% cheaper than the standard Uber car service. Unlike Careem Bus that currently supports cash only, Uber Bus will allow users to pay using cash or credit card. Last month, Uber’s East Africa General Manager Loic Amado, speaking to Reuters had said that they’re looking into the possibility of launching a similar service in Nairobi as well. It is not clear if Uber has added any new routes or made any changes since first announcing that they’re testing the service. Update – 1:45 PM GMT: The story was updated with more details after the press conference of Uber CEO.